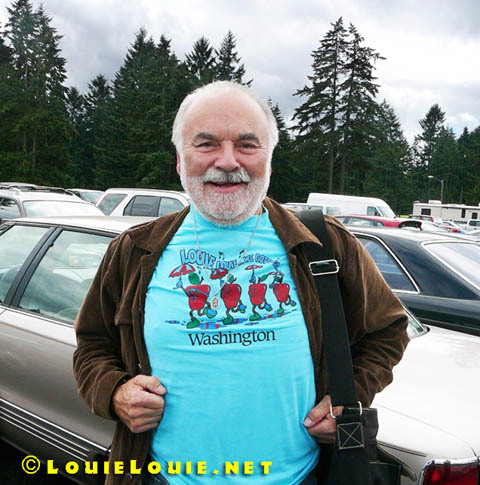 George Barner, Northwest musician and major proponent of the Washington state LOUIE LOUIE initiative, models a vintage T-shirt from his collection. The Natalis Group was responsible for coordinating all the audio-video tech stuff behind the LOUIE FEST, as well as the webpage. These guys are my pals – Robert Mackie, Hope Mackie, Steve Carlson and some guy driving the golf cart whose name I didn’t catch. 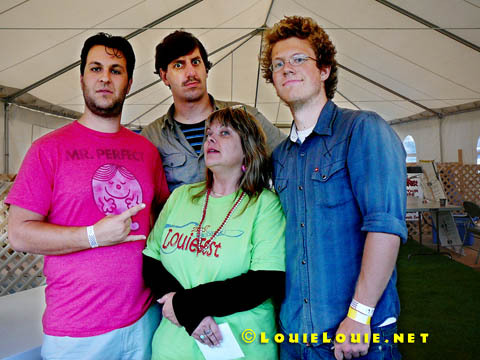 Merri Sutton, one of the major coordinators of this year’s LOUIE FEST, poses for a photo with Mall Security, one of the first bands I’ve ever seen with an original version of LOUIE LOUIE on their MySpace page. Did you know that this band actually embraced Llamas as a mascot before LLAMAS was ever founded? Intuitive, wouldn’t you say? I’m guessing it has something to do with mental floss…. 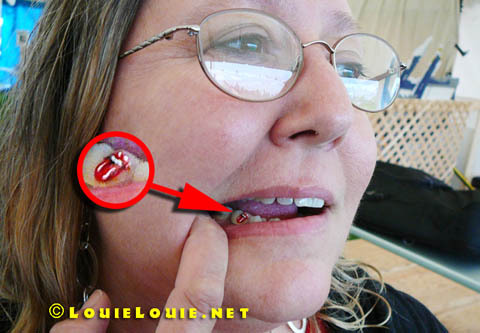 Lori Morisette, aka “Tongue Lady,” shows off her serious appreciation for the Rolling Stones with a tooth tattoo. 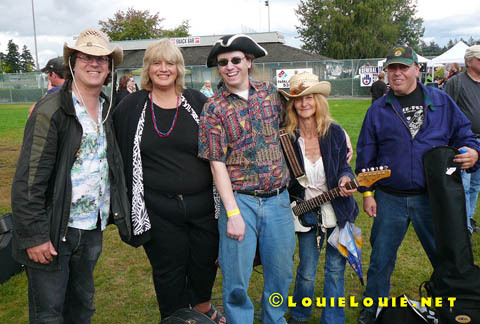 Besides the silly guy on the left with the straw hat (that would be me), this photo includes Debbee Adams (publisher of 60’s Beat), Ron Fowler of Jeff & the RF’s (wearing a hat that would make Paul Revere proud), Jan Cramer, and Jeff Fowler, aka the Jeff in Jeff & the RF’s. For the remainder of the week, I’m going to try an experiment. I wrote up some other entries last night, but I’ll schedule them to show up at different days of the week. 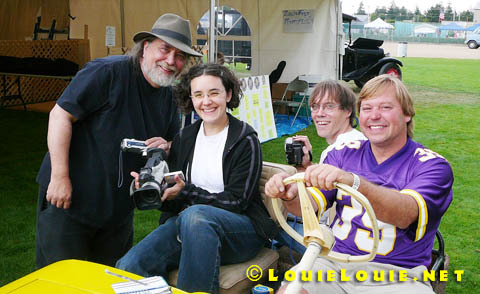 If I happen to stumble upon a LOUIE story and have access to the internet, I’ll try to post ’em live from Burning Man. Otherwise… I’m vacation this week!